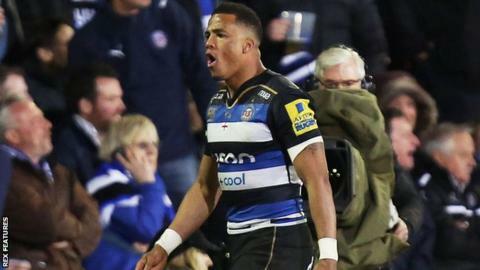 Bath full-back Anthony Watson faces two Rugby Football Union charges after being sent off in the loss to Saracens. Watson, 22, is charged with an "act contrary to good sportsmanship", as well as tackling Alex Goode in the air. The first offence alleges he used "offensive, inappropriate and unprofessional" language after being sent off. Watson featured in every Six Nations game for England this year as they won their first Grand Slam since 2003. England tour Australia in June and Watson's place may be in doubt if he is found guilty of a dangerous tackle at a hearing on Tuesday, with the charge carrying a top end sanction of 10 weeks. If found guilty, the minimum punishment is a two-week suspension. Former London Irish player Watson could face penalties ranging from a reprimand, to a financial penalty, or a suspension if he is found guilty of the unsportsmanlike conduct charge. Bath - beaten finalists last year - are ninth in the Premiership table with four games left to play this season.